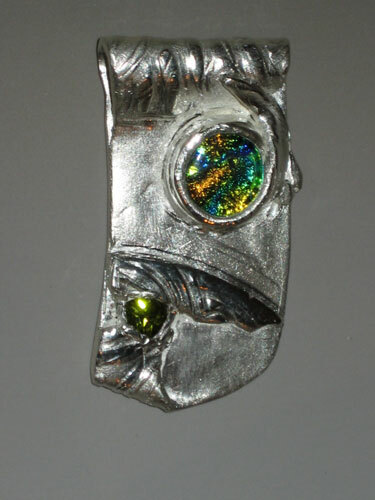 Fine silver PMC pendant with a green/gold dichroic glass cabochon and faceted triangle peridot. Pendant is textured on the back for a special ‘hidden’ design. This one-of-a-kind handmade design can’t be duplicated! Comes with your choice of a 16" black suede cord with a lobster clasp or a 24" silver-tone chain with a simple spring clasp.